This tool is "Yet Another" audio converter. By default, you can convert between fuz, xwm and wav files. By separately download and install LAME or FFmpeg, you can convert to/from various audio files such as mp3, and convert from various video files such as mp4. And you can also convert audio from bsa/ba2 directly. 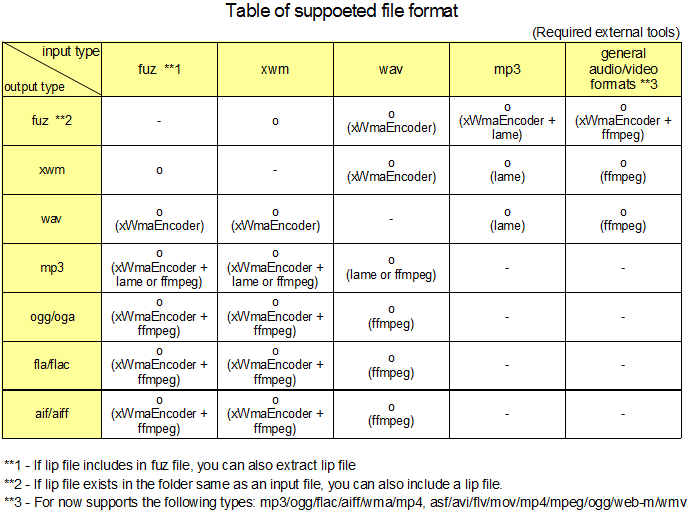 Microsoft (R) xWMA Encoding Tool Copyright (C) 2009 Microsoft Corporation. All rights reserved. In this version, you need to install it in a clean folder. Do not overwrite the old version folder. -Support FO4 BA2/Skyrim SE BSA format. -Output folder history: You can recall the output folder you used before (max 10). -File status dialog: You can see the status of each files. It is especially useful for checking error messages for each files. You can show it from the right-click menu on the file. -In order to avoid bugs and improve development efficiency, changed the required version of .NET Framework from 4.0 to 4.6.1. -Scrollable option panel: You can scroll conversion options panel. -New option "Create subfolders" : For files added by opening folders or BSA, create subfolders in the output folder. "Subfolder" will determined based on the opened folder path, or the path of opened BSA, so this function does not work when opening individual files. -Improve conversion cancellation. Now you can cancel immediately while processing external processes such as ffmpeg. 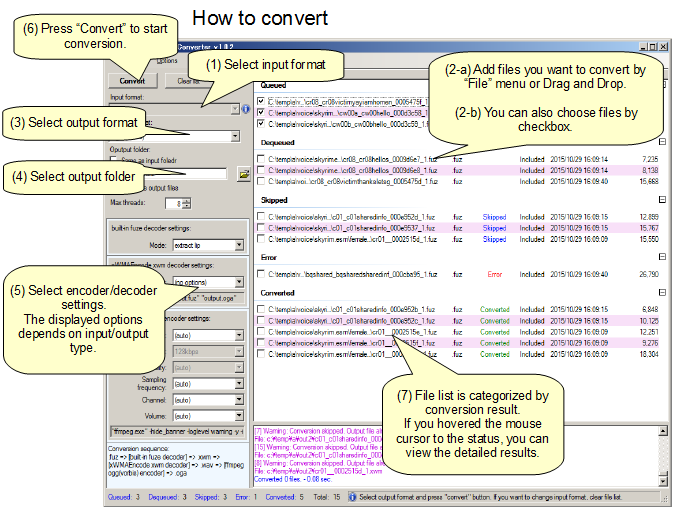 -Now you can convert from video format to audio format, and you can convert audio files (other than .wav) eeach other. -Changed the configuration of the installation files. -Fixed a bug that special characters included in file names in BSA are not processed correctly. I was assumed that BSA contained the code page 1252 characters. - From the right-click menu of the file list, you can open input/output file and input/output folder and input bsa file. If input file is in bsa file, to open it extract to temporary folder. If the fuz file, to open it extract xwm to temporary folder. - When you double-click a file in the file list, you can open input file. When you double-click the "Converted" in the status column, you can open output file. - The text file name of the command help, change to a meaningful name. - Improvement and localization of the error message. - Simplification of the error message. Stack trace log becomes optional, you can switch from the options menu. - Fix problem that when right-click on checkbox in file list, list of files will not be re-drawn. - Fix problem that when show the "About" dialog, re-drawing problem of the file list is not reset correctly. 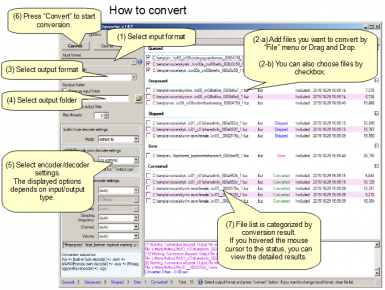 - All of the conversion settings are saved to ini file. Settings will be carried over to the next startup. 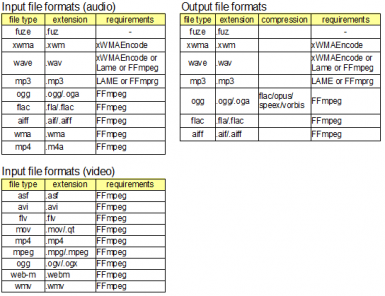 - If you install FFmpeg, you can convert from general video formats (avi, flv, mpg, mp4, etc.). Not tested so much, the success of the conversion depends on the specifications of FFmpeg, but it has been good conversion in my stock of the video files (flv, wmv, mp4). Please specify additional arguments when there is a problem. - (Bug fix) Fix "No such file or directory" error on external commands when there is a continuous space in the file name. - (Bug fix) Improvement at the UI language switching. - Mod name was changed to "Yakitori Audio Converter" from "Yet Another Audio Converter". Because I noticed that the other tool of the same name exists in the world, so in order to avoid misunderstanding. When I thought about next naming, I was just eating yakitori, so I had named this. - Additional percentage options of the list of the sound volume. You can adjust a little more finely sound volume. - Additional text boxes to specify the additional argument for LAME and FFmpeg. If you have knowledge of the command argument, you can free to add additional argument to LAME and FFmpeg. In FFmpeg, two kinds of additional arguments can be specified. "Additional arg." is argument for the (FFmpeg's) input file, "Additional arg. 2" is argument for the (FFmpeg's) output file. Please be aware of the proper use of two additional arguments. - When the conversion using the FFmpeg, you can change sound volume. Also you can convert audio files from bsa/ba2 directly. Just drop bsa/ba2 files to the tool window. At first the name of this tool was "Yet Another Audio Converter". However, I noticed that there was already a tool with the same name and decided to think about another name to avoid confusion. Then I went to a izakaya(Japanese pub) and ordered some beer and Yakitori, and suddenly I came up with the idea, so naming it to Yakitori (no sense but I wanted to name the beginning with "Y" lol). For Japanese users: Japanese guide now available. I'm often convert fuz files to wav/mp3 format and editing with Audacity or playback with Media Player. For this kind of work, Skyrim Audio Converter by JohnB https://www.nexusmods.com/skyrim/mods/8303/ met comparative requirements. I was using all the way this tool but sometimes bit unstable in my PC and I wanted to specify more conversion parameters, so I decided to develop this tool. I want to emphasize that Skyrim Audio Converter gave me a big inspiration on developing this tool. Many thanks JohnB! With other similar tools in NexusMods, the flow of conversions is hidden and it is not clear which option will affect which external tool. This is useful for simplifying UI and ease of use, but It may be difficult to deal with conversion errors because the parameters of external tools cannot be tweaked. So I designed the conversion flow and the parameters of the external tool clearly, and designed to be able to choose conversion options for each external tool. You may think that this is too complicated but do not worry. Basically you can convert with default option. - You can select audio files to convert from menu or drag and drop. Selected files will be added to the file list. - You can select single files, folders and bsa/ba2 files. - Use the check box of the file list, you can choose the file you want to convert. - By default, you can convert between fuz, xwm and wav (Lip files can be handled together). - If you install LAME, you can convert between wav and mp3. 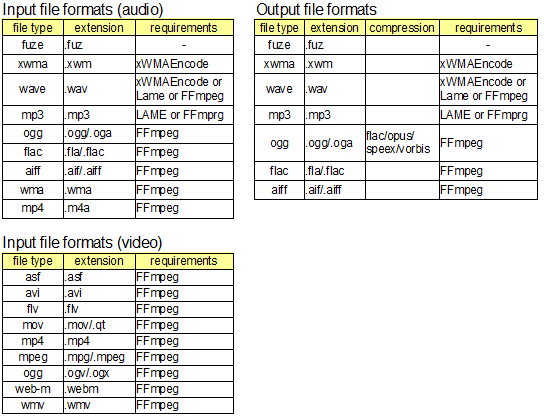 - If you install FFmpeg, you can convert between wav and various audio file formats (mp3, ogg, flac, aiff, etc.). - If you install FFmpeg, you can convert from various video formats (avi, flv, mpg, mp4, etc.). - Converted files can be output to the same as input folder, or the specified folder. - If you select the "Create subfolders" option, the folder hierarchy of the input file will be re-created in the output folder. Note that "Subfolder" will determined based on the opened folder or BSA path, so this function does not work when opening individual files. - You can choose a variety of conversion options. Don't worry though you may feel a bit complicated. Basically, it can be converted by the default settings. - Merging audio and lip files into Fuz is very easy. Just place a lip file with the same name in the folder with the audio file. - Convenient file list (maybe!). Audio files are categorized depending on the status. The list displays useful information, such as the result of the conversion or the presence of a lip file. Also, you can sort by clicking on the column header. - From the right-click menu of the file list, you can open input/output files, input/output folders and bsa/ba2 files. - All of the settings are saved to INI file and will be carried over to the next startup. - You can show the command help of LAME and FFmpeg from the Help menu. You don't need to open command prompt for reading help message. It should help to specify the additional arguments on the conversion option. - Multi-language support. Currently supports English and Japanese. If you are interested in translating UI please contact me. - Conversion is parallelized in multi-process and multi-thread. The default parallel number depends on the number of logical processors in your CPU. You can change the parallel number in the UI. Required in order to handle mp3 files. But not required If there is FFmpeg. 32bit version or 64bit version, either one is OK. Required in order to handle various audio/video files. 32-bit static version or 64-bit static version, either one is OK.
Download zip file and extract zip to any folder (Recommended other than "Program Files" folder and Bethesda game folder). The optional external tools (lame.exe, ffmpeg.exe), please copy into the installation folder. NOTE: In version 1.4, the configuration of the installation folder has been changed. To upgrade from a version earlier than version 1.4, please clear the installation folder before installing. Delete the installed files and folders. Registry does not used. (2-a) Add audio files you want to convert by "File" menu or Drag and Drop. (2-b) You can also choose files by checkbox. (5) (Optional) Select encoder/decoder settings. The displayed options depends on input/output type. If you don't know exactly what you do, just leave the default value. (6) Press "Convert" button to start conversion. (7) When conversion is finished, file list is categorized by conversion result. If it can not be converted, an error message is output to the log. You can see errors for each files by "Show file status" menu on the right-click menu. - There may be a bug in this tool. Please be sure to MAKE A BACKUP of the original audio files. - The result of the conversion depends on the external tool. If a conversion error occurs, look at the message of the external command contained in the errpr message. - The number of rows in the Log window can affect performance. Please clear it regularly. - ListView of .NET (in particular grouping feature) is very slow and buggy, so I was as much as possible tweak and tuning. If the file list is no longer being re-drawn, just show "About" dialog (Help - About menu) to reset. If such a problem occurs frequently, please report to me. - You can enjoy the converted file freely, but please pay attention to the copyright of the original music and video when distributing or publishing to the public. - Errors on encoding xwm : "Error: Unable to convert sound file. External command xWMAEncode.exe error. ExitCode: -2147221501"
1. 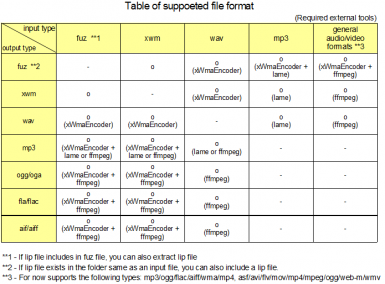 Input Format: Select "audio files (ffmpeg)". If there is no item, please install ffmpeg.exe in the Yakitori folder. 5. If no luck, try lowering the sampling frequency and bitrate. - Errors on decoding xwm : "Unable to convert sound file. External command xWMAEncode.exe error. ExitCode: -2147024809 ... ERROR: Input file type is neither PCM nor xWMA"
- Errors on decoding xwm : "Unable to convert sound file. External command xWMAEncode.exe error. ExitCode: -2003238911 ... ERROR: Requested audio format unsupported: format tag must be WAVE_FORMAT_PCM or WAVE_FORMAT_IEEE_FLOAT"
Perhaps this file is not a fuz(xwm) format for PC, can not be handled with this tool. - Errors on encoding xwm : "Error: Unable to convert sound file. External command xWMAEncode.exe error. ExitCode: -2147467263 ... failed with error E_NOTIMPL (Not implemented)"
Therefore in this example, change the bitrate of xwm to 32kbps or change the sampling frequency of input audio to 32kHz/44.1kHz/48kHz. His work gave me a big inspiration on developing this tool. Many thanks! The discussion on the file format on this forum was very useful to me. And, thanks for all over the modding community, Nexus Mods, Bethesda and YOU!